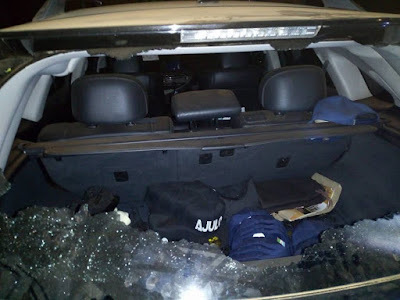 Mr. Raheem Olawuyi, the All Progressives Congress candidate for the Irepodun/Ekiti/Oke-Ero and Isin federal constituency November 17 bye-election, was on Thursday, allegedly attack by unknown gunmen. Mr Femi David, the campaign spokesman told the News Agency of Nigeria that Olawuyi was attacked at Idofin Igbana area during a campaign tour of Oke-Ero Local Government. The campaign team was said to have been led by some members of the APC state executives and party stalwarts. The assailants were said to have laid siege at the entrance of the town along the busy road before shooting at their target at close range. NAN reports that the back screen of Olawuyi’s Lexus Jeep was shattered following the impact of the attack. Olawuyi, the driver and two other stalwarts of the party, were said to have escaped unhurt in the Jeep. The supporters of the party described the act as barbaric and crude, noting that the perpetrators must face the full wrath of the law when apprehended. NAN reports that the community vigilante immediately swung into action by mobilising and combing the surrounding bush to locate the perpetrators. Olawuyi, while addressing his supporters at Idofin Igbana afterwards at about 2am, urged them to remain calm and steadfast. He said that the act was one of the prizes for freedom and that they should remain undaunted and undeterred. The Force Public Relation Officer of the Kwara State Command, Ajayi Okasami, told NAN that they are awaiting official report about the incidence from Omu Aran. NAN reports that Olawuyi and the Peoples Democratic Party candidate for the election, Mr Jimoh Alatise are from Omu-Aran.